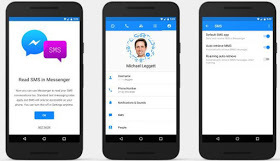 As earlier suggested 12 weeks in the past whilst on beta phase, David Marcus (Former President at PayPal ) took to his facebook page the previous day to announce that you may now send SMS through Facebook Messenger on android. "A lot of Android texting apps didn't keep up with the evolution of messaging, so we felt like we truly had to make Messenger the best SMS client for Android. As a result, in addition to having a fully integrated app for all your messaging. You're now able to send voice clips, stickers and even share your location over SMS on top of standard texting features. You'll now also enjoy all the things you've come to love Messenger for all your messages, including chat heads and more". For you to activate this feature you just need to go to settings, select "SMS" and now set it as "Default SMS app". When you've done that your conversation will now start appearing in Messenger as a purple threads, alongside your Messenger chats. NOTE: Standard SMS charges still applies on Messenger. ENJOY YOUR NEW MESSAGING EXPERIENCE.